James On The Run winning the FQHRA Stallion Stakes Futurity at Hialeah Park on Sunday. HIALEAH, FL�DECEMBER 30, 2012�Fastest qualifiers James On The Run led a trifecta of IVORY JAMES two-year-olds across the wire Sunday afternoon in the $85,270 FQHRA Stallion Stakes Futurity at Hialeah Park. Under jockey Raul Gutierrez the James On The Run completed the 350 yard course :17.841 seconds, picking up his fourth consecutive victory. The $37,960 winner's purse more than doubled James On The Run's season earnings total of $64,273. Brandon Muniz, who also saddled the top-three finishers, trains James On The Run for owners Ranch Los Dos Potrillos, LLC. Bobby D. Cox bred the brown gelding in Texas from the Invisible Injun mare Injun On The Run. He earned $15,529 for the effort. 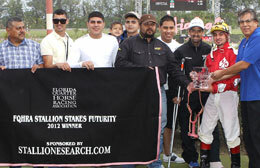 Q-Racing Ace John Hernandez (right) presents the FQHRA Stallion Stakes Futurity trophy to winning jockey Raul Gutierrez, qualifying jockey Alex Baldillez, Jr. and trainer Brandon Muniz. Ryon James, another Muniz trainee, finished second for R.T. Stables. Still winless in seven starts this season, the IVORY JAMES gelding has been second or third in five of those starts. 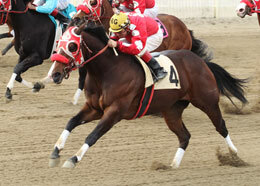 Jeramie Fennell rode the Texas bred who picked up $10,352. John Shaw and Sylvia Pitman bred the 2-year-old from the Dean Miracle mare Baja Rosa. What Gives, another IVORY JAMES gelding, also owned by R.T. Stables and trained by Muniz, finished in the show position. Also a Texas bred by Bobby D. Cox, What Gives is out of the Special Effort mare Special Genuine. Freddie Martinez had the riding assignment. Completing the field were Huntin Ivory, Political Hope, Zizzle, Bourbonstreet Boogie, Shawnee Dreams and Hello Georgia. Mr Jess Down Focash was scratched.